Are looking for a beautifully decorated, spacious 2 bedroom condo with an open floor plan and amazing views of the Gulf? 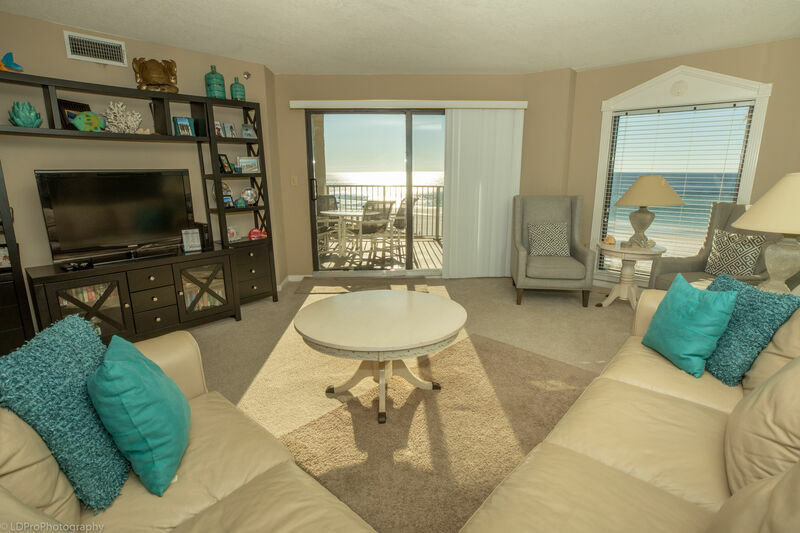 Inlet Reef 306 is the place for you. You enter the condo through an entry way leading to the kitchen which is done completely in authentic tile on both the floor and counters with two sinks and a large preparation area/bar. The dining area hosts a large dining room table that sits 6 with ease. The living room has carpet, a big screen Samsung HDTV, with a comfortable sectional sofa that folds out into a Queen Sofa sleeper, and a chase lounge. The master bedroom has a King size bed, Flat screen TV, and & balcony access. The Master Bathroom boasts double vanity sinks. The guest bedroom has two Twin beds and a Flat Screen TV. The guest bathroom has a combination tub/shower. There is an additional nook, adjacent to the kitchen, that the owner has turned in to a nice office with a desk for those who wish to mix business with pleasure. The tile balcony has a very nice table for sitting or dining, as well as a tile wetbar, and offers astonishing views of the Gulf of Mexico. The condo comes with a full size washer/dryer, and complimentary high-speed WiFi internet capabilities. Gorgeous condo with perfect view! Enjoyed our stay at this homey and comfortable condo. Had all the amenities we needed plus an amazing location and view. Would definitely stay here again! Wonderful stay as usual ! We love our great service from you guys ! Thanks for everything !